Belcarra USBLAN for Windows is a USB Class driver for Microsoft Windows Operating Systems that implements an extensively proven and effective Networking over USB solution. Optimized for high data throughput, the driver seamlessly recognizes the protocol (NCM, EEM, ECM, RNDIS) offered by the device. Multiple devices can be connected to a PC simultaneously and device to device communication is available. Belcarra has created Beagle TestDrive, an edition of Belcarra’s USB Testdrive for the BeagleBone Black to allow rapid prototyping of networking over USB protocols. Testdrive uses the Beaglebone as a proxy for an OEM device on the device side of the USB link. Matching demo editions of Belcarra USBLAN for Windows are automatically installed on the host PC from Windows Update as necessary. Beagle TestDrive is provided as a MicroSD SDHC image. The Beaglebone Black can boot TestDrive without modifying the onboard firmware. Simple commands change the USB network configuration (protocol, hardware ID) dynamically until the next reboot, or select one of several USB configurations which take effect at the next boot. This table summarizes the available types of USBLAN for Windows kits. For Windows 10 Anniversary systems the most recent version (USBLAN v2.4.11) has been specifically signed and is available on Windows Update. Belcarra"s USBLAN DemoDriver for Windows 10 systems is now available from Windows Update. To use this evaluation version the device will need to offer Vendor ID 0x15ec and Product ID 0xd041 (refer to OEM Manual, section 2.0 Evaluation - Demo Driver ). NOTE: as this is an evaluation version it will run for only 30 minutes at a time. Current USBLAN for Windows driver kits support Windows XP, Windows 7, Windows 8.1 and Windows 10. All releases of Belcarra's USBLAN for Windows 10 kits have EV certification, have been submitted through the Microsoft SysDev portal and have received a Microsoft digital signature. This paper describes how to build and manage a TCP/IP network for USB devices. Ethernet-style networking can very simply be extended to attached USB devices. Belcarra’s USBLAN for Window’s built-in DHCP server for address assignment, management and device discovery solutions has been implemented to fit within the network paradigm requirements. 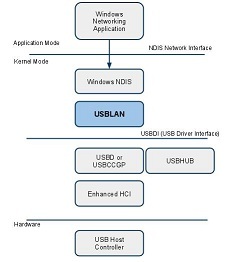 USBLAN for Window’s implements USB-IF (www.usb.org) Communications Device Class protocols (CDC-NCM, EEM, ECM and others) and will create an Ethernet-style networking segment for each attached USB device. Networking over USB protocols such as CDC-ECM, Microsoft RNDIS, CDC-NCM, were originally designed to provide USB-mediated access to an external network, and address management was seen as a matter for the external network segment. On such external segments, a DHCP server was usually available. Now, however, the great majority of USB devices using these protocols are smart devices which use a network style command channel, but do not provide access to an external network medium. Therefore, the network segment terminates at the device, and there are only two nodes on the network: the USB host (Windows) and the device. The DHCP service within Belcarra USBLAN for Window’s is a special service for such network segments. The following describes how the network layer (IP) addresses can be seamlessly set up on top of the link layer and some pointers and strategies on OEM software running on Windows co-operating with the device to enable network-based device discovery. An evaluation version of Belcarra's USBLAN is now available from Windows Update for Windows 8/8.1 users. To get the driver, simply ensure that the Windows system is connected to the Internet, plug the device in (configured with the correct VID/PID) and let Windows search Windows Update. The protocol (CDC-ECM, CDC-EEM, CDC-NCM, RNDIS) is automatically detected. The INF file of the USBLAN evaluation driver creates global variables in the registry using Service name BelcarraDemoUSBLAN. These parameters can be modified later using RegEdit (see Section 5.2ff in the OEM Manual). As noted above, the parameter DHCPDType in the demo is inferred from the Product ID and in particular setting it in the registry has no effect. Please note this is an evaluation version only and will run for 30 minutes at a time. It must be re-plugged to continue use after time expires. Windows Embedded Standard 7 (WES7), is a componentized version of Microsoft’s Windows 7 operating system that can be easily configured to use Belcarra's USBLAN Networking over USB solutions. The Belcarra USBLAN driver is available from Windows Update for evaluation (see manual). Whereas for a standard Windows 7 system connected to the Internet, simply attach a device that offers the appropriate Hardware ID's (VID: 0x15ec / PID: 0xd031), allow the system to search Windows Update and install. For WES7, the driver must be downloaded separately from Windows Update (download also available) and added to the WES7 image. Note: the evaluation version will run for only 30 minutes and then must be replugged to continue use. Should you need assistance acquiring the .cab file or wish to receive an evaluation version that does not have the time limitation please contact us. The Belcarra USBLAN for Windows driver is delivered as a ready to use installation kit branded to the OEM requirements and fully signed for installation on Windows desktop operating systems. It can also be delivered as a Microsoft signed driver and be seamlessly available to end users from Windows Update. Belcarra’s USBLAN for Windows driver implements networking over USB solutions for industry standard protocols. The driver is optimized for high data throughput and automatically recognizes the Windows Operating System and the CDC protocol offered by the device. Multiple devices can be connected to a PC simultaneously and device to device communication is available. Belcarra USB TestDrive - an overview of an environment for testing USB Networking protocols - includes both USB Host and USB Device side software components. BelcarraTestDrive - an overview of Belcarra’s USB Test Environment, a Linux based test system based on the Gumstix Overo board. USB TestDrive Setup - an overview of USB Device testing using Belcarra’s Overo USB Test Environment. Windows USB TestDrive Setup - an overview of setting up a Microsoft Windows system to do testing of USB devices with tools such as Apache and Cygwin. An Android based device that has appropriate USB Device support (e.g. OMAP devices) can use the Linux Gadget ECM networking driver to seamlessly connect to Windows. Typically mDNS (using avahi on the device and Bonjour under Windows) can be used to do fast device discovery so that applications on each side (Windows and Device) can find each other and do data synchronization. An Android based device that has appropriate USB Device support (e.g. OMAP devices) can use the Linux Gadget ECM networking driver to seamlessly connect to Windows. If the Android device has an Internet connection (3GS, cable, ADSL) then standard Linux networking can support either a NAT, routed or switched network connection to allow the Windows system to be connected to the Internet. Copyright 2003-2013 Belcarra Technologies (2005) Corp. info@belcarra.com. Powered by Blogger.